If you’re flying with babies and children to New York, it is useful to prepare as well as possible. How to deal with booking tickets for your children? Are there any special arrangements or discounts? What do you need to bear in mind during the flight? And, what are the transportation options from the airport? Below, you’ll find my personal advice with answers to all these questions. So don’t worry about the flight and start thinking about what to do with kids in New York. Flying with a baby is always a challenge, especially if it’s a long flight. Airlines charge the full price if you book a separate seat for your baby. If you keep them on your lap, the ticket will cost around 10% of adult fare. Most of the flights to New York are fully booked, so you can’t just assume the seat next to you will be empty. Each airline has slightly different rules regarding seating for families with small children. However, my experience is that no carrier really takes this into account, not even if you are willing to pay more. 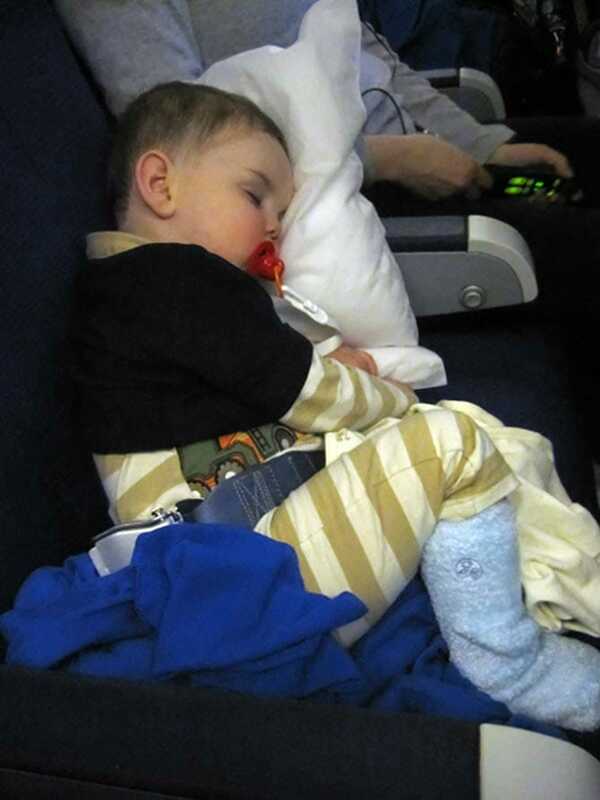 There are so-called “bulkhead seats” available, onto which an in-flight crib can be attached. This makes the trip for the parents and the baby much easier. I was, however, only able to reserve these seats once. The other times, the seats were occupied by passengers without children. The best way to get these seats is to phone the carrier directly after booking. If you couldn’t get one of these seats, then I suggest you go to the airport as early as possible to try again there. Keep in mind that the in-flight cribs can carry a maximum weight of around 20lbs / 10kg. The policy for boarding with kids is very different between airlines. Some airlines, for example United Airlines, allow parents with young children to board earlier. Waiting in a long queue holding a child can be very stressful. Keep in mind that you might have to store your nappy bag 15 rows down because many of the luggage compartments are already full. A children’s menu is available for your child. Sometimes, when booking a flight you can indicate that you would like your child to receive a children’s menu. Does your child only drink milk? Then make sure that you always bring some extra milk in case of possible delays. Besides that, there can also be long queues of 2 or 3 hours at the customs in New York. The milk can be heated for you on board. Try to plan when to feed your baby. As soon as you land it will take a while before you can find somewhere where you can (breast) feed or heat up a bottle. So try and schedule the last feeding as late as possible during the flight. Eric’s Tip: I would advise you to have a short conversation with the people sitting behind and in front of you. It’s a small effort to tell them beforehand that you will do everything to try and keep your baby calm during the flight. Most people will react positively and they won’t be as bothered when the baby cries during the flight. When you decide to take a shuttle bus or a taxi from the airport to your hotel, it’s important to know that it’s required by law to have a car seat. If your hotel is near a subway station and you don’t have too much luggage, you could consider to take the subway. You can also choose to book a private transfer from the airport, where you can add a child seat for an extra fee. From 2 years onwards you will need to book a separate seat for your child. The price for the ticket is the same price as booking a ticket for yourself, so you don’t get a discount. Before booking check the seating plan of the aircraft. A lot of the times a family of three will be split up as the seats are in pairs. You can avoid this by checking the seating plan beforehand. This is of course no guarantee, but at least you’ll be a step ahead of the others who didn’t do so. It is also a good idea to let your children play around at the airport. I can still hear my mother say: “This is no playground!” If you let children be children, they’ll probably be a lot quieter on the long flight. Most of the flights to New York have small screens to watch cartoons and to play games on. This is not the moment to teach your child that watching TV is not good for them! Be sure to bring some things yourself. If your flight does not have a screen, then bringing along a tablet is ideal. Make sure there are enough fun things to do on the tablet BEFORE you leave. It is also fun to prepare your children for what they’ll be seeing by telling them about New York. You might be able to read a nice book to them or do a puzzle. 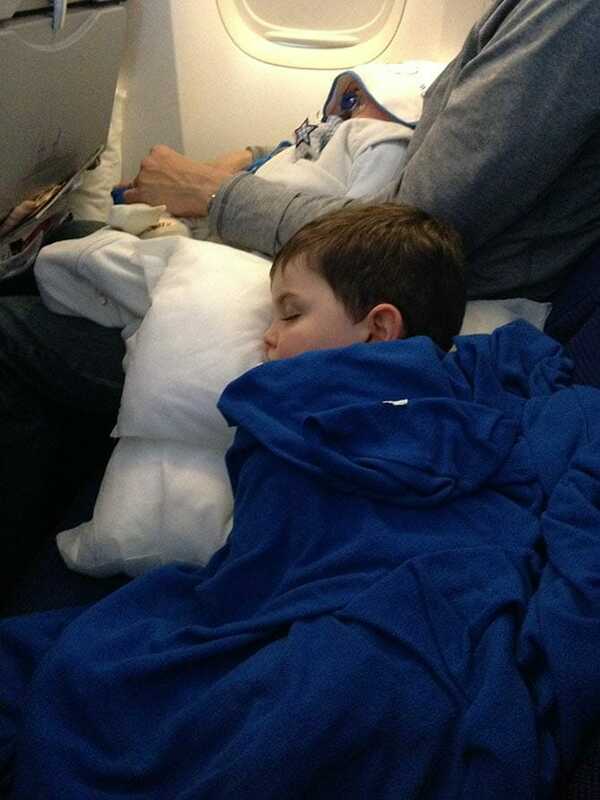 The flight is long and so a lot of children will sleep for a couple of hours. It’s no problem to make a bed for your child on the ground in front of you with some pillows and your jacket. The downside is that with turbulence you will have to wake them up. Make sure to bring along thick socks so that your child can take off their shoes. I’ve seen some children with big pillows, I wouldn’t do this myself BUT it looks very comfortable. One of the most annoying things for a fellow passenger is either a child kicking the back of their seat or noisy tablets / consoles. A child will, of course, act like a child but these annoyances are avoided by bringing along a headset or telling your child not to kick the seat. As soon as everyone is seated, I ask the people in front of me and behind to let me know if anything is bothering them. Their reactions are always very friendly and people are usually less irritated if things don’t go according to plan.